If you haven’t tried tofu before or don’t know what to do with it, this recipe is for you! Tofu is a good source of plant protein and the veggies provide you with essential vitamins, minerals, fibre and low GI carbohydrates. 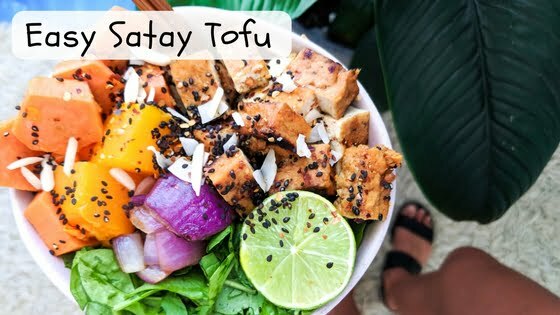 Top this off with the delicious satay sauce made with nuts and a sprinkle of black sesame seeds and you have yourself a delicious tofu lunch or dinner that is healthy, balanced & complete. Plus you can save yourself some time and make a double serving to enjoy for lunch or dinner the following day. Steam pumpkin & sweet potato. Remove from heat and place in bowl. In a blender, combine satay ingredients. Remove and put aside. Heat sesame seed oil in a wok & cook onion until translucnet. Remove from pan. Add tofu to pan and cook. Once cooked stir in satay sauce & coat. 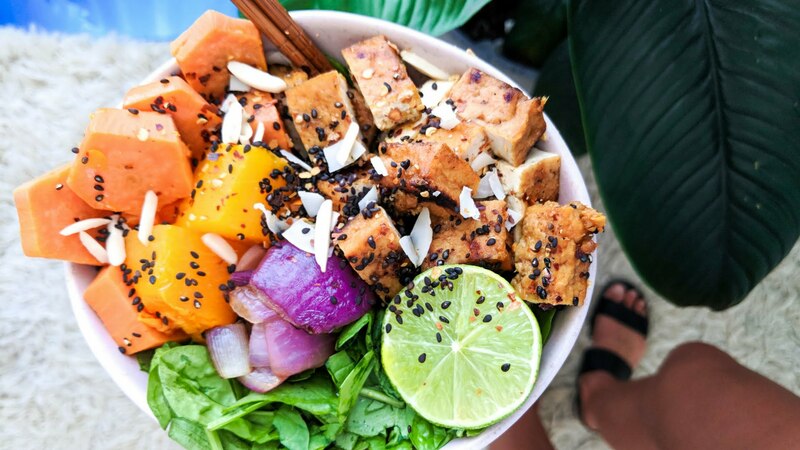 Remove tofu from pan and place in bowl with veggies. Sprinkle with sesame seeds, coconut & chilli. Squeeze on lime juice and combine all ingredients. Enjoy.